I only caused minimal damage to the merchandise. 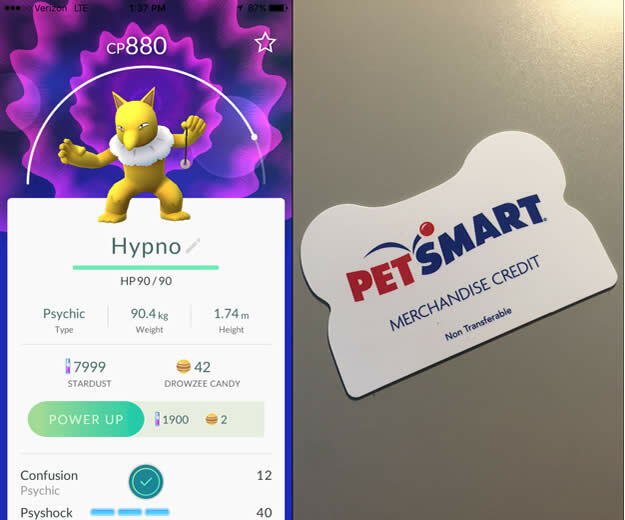 On the way out, I read the rest of the sandwich board and found out that the first 20 people to catch a Pokémon in the store got a free $10 PetSmart gift card. So I went back in, showed my Pokémon “journal” with my capture, got a “Not too shabby.” face-nod from the staffer and was handed the gift card on the spot. Sweet! And me being me, I then posted about it on Instagram, Facebook, Twitter and Tumblr from the PetSmart parking lot because there were still 12 cards left. And I’m writing about it now in this blog post. So great job on acting fast and getting in early on a pop culture phenom, PetSmart! You proved your relevance, looked darn smart, have the town’s largest selection of litter boxes, and totally made a customer’s day.